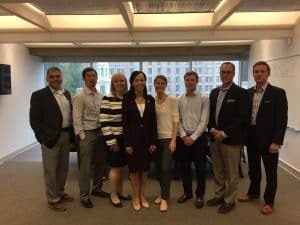 This week, Pango Financial President Candice Caruso joined Delaware Representative Lisa Blunt Rochester and local business and franchise leaders for a Small Business Roundtable. Candice serves as the Delaware State Captain for the Franchise Action Network to bring together franchisees and franchisors with government officials. 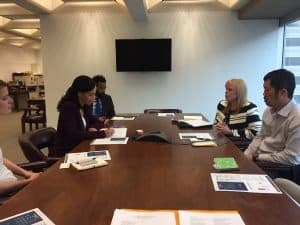 Co-hosted by the IFA and Franchise Action Network, the round table discussion focused on the success of franchising in the state of Delaware and current policies and proposals for the 115th session of Congress that affect the future of small business in America. -Delaware’s economy is shifting away from a dependence on large business. As a result a more diversified small business community is emerging. What does this climate look like today? -How can we make Delaware a more entrepreneurial environment for small business owners? 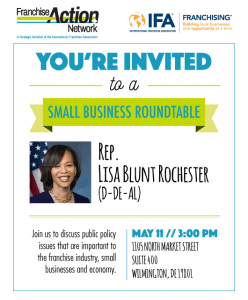 -What legislation challenges franchisees and small business owners? -Are there special programs to provide incentives to outplaced workers who are unable to find a job to open a business or franchise? -How can we retain top talent here in the state? Pango Financial is headquartered in Delaware along with many other Fortune 500 companies. We are pleased to be part of the open working relationship with Delaware’s newest member of Congress to help further the interests of small business and franchise owners in national policy.